This is the Chat Color Selector page for the Wiki of TextCosmetics. TextCosmetics' Chat Color Selector is the easy to use, completely configurable GUI for changing your chat color. Simply open the Chat Color Selector by executing the "/chatcolor" command, then pick out your perfect chat color. 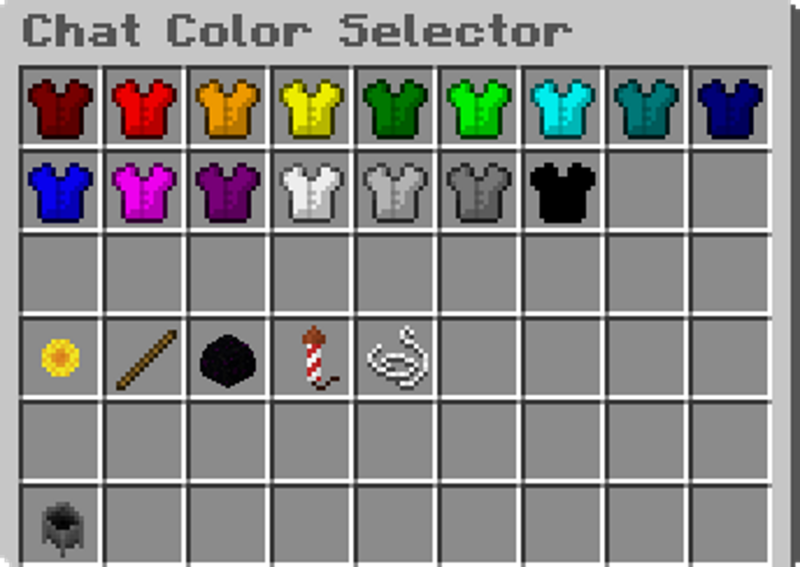 By default, there are 16 configurable colored leather chestplate items representing its chat color, and 5 configurable items representing its chat format. For example, the Dark Red colored leather chestplate represents the Dark Red chat color, the Yellow colored leather chestplate represents the Yellow chat color, and so on. To add a chat color to your chat color, hover over an item in the Chat Color Selector to view its chat color information. 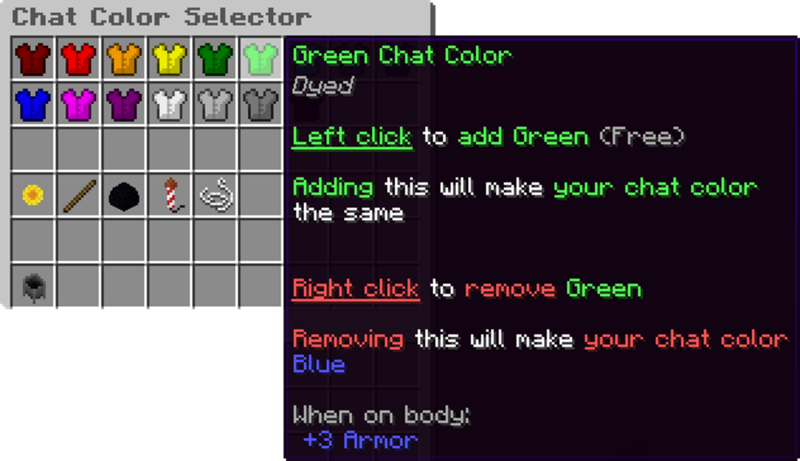 Once when you have decided what chat color you want to add to your chat color, left click on the item, and the chat color will be added to your chat color. For example, hovering over the Dark Red colored leather chestplate brings up the information for the Dark Red chat color. When left clicked, the Dark Red chat color gets added to your chat color. Note: The Chat Color Selector will not close by itself after adding a chat color. You must close the Chat Color Selector just like you would close your inventory. Great! Dark Red is now added to your chat color. But why stop there? Let's throw in Red, Gold, Yellow, Dark Green, Green, Aqua, Dark Aqua, Dark Blue, Blue, Light Purple, and Bold! Just like adding a chat color, hover over an item in the Chat Color Selector to view its chat color information. 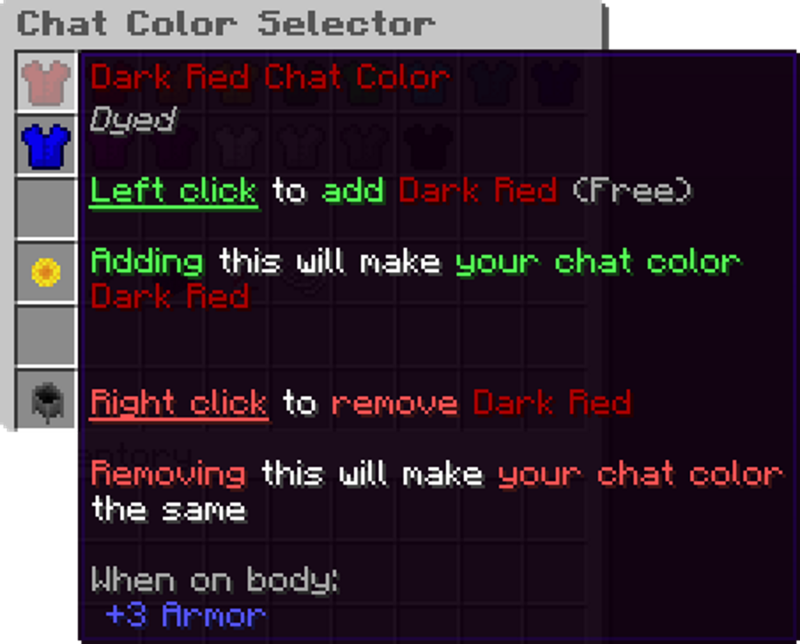 When you have found which chat color you want to remove from your chat color, right click on the item, and the chat color will be removed from your chat color. For example, if you have a chat color of Blue and Green, and you want to remove Green from your chat color, hover over the Green leather colored chestplate. Then right click on it. Note: The Chat Color Selector will not close by itself after removing a chat color. You must close the Chat Color Selector just like you would close your inventory. Good job! Green is now removed from your chat color. Just like removing a chat color, hover over the cauldron item, which represents the reset chat format - cauldron by default (changeable, just like everything else in TextCosmetics), - in the Chat Color Selector to view its chat format information. When you have found the cauldron item, left click on the item, and your chat color will be reset. For example, if you want to reset your chat color, hover over the the cauldron item. Then left click on it. 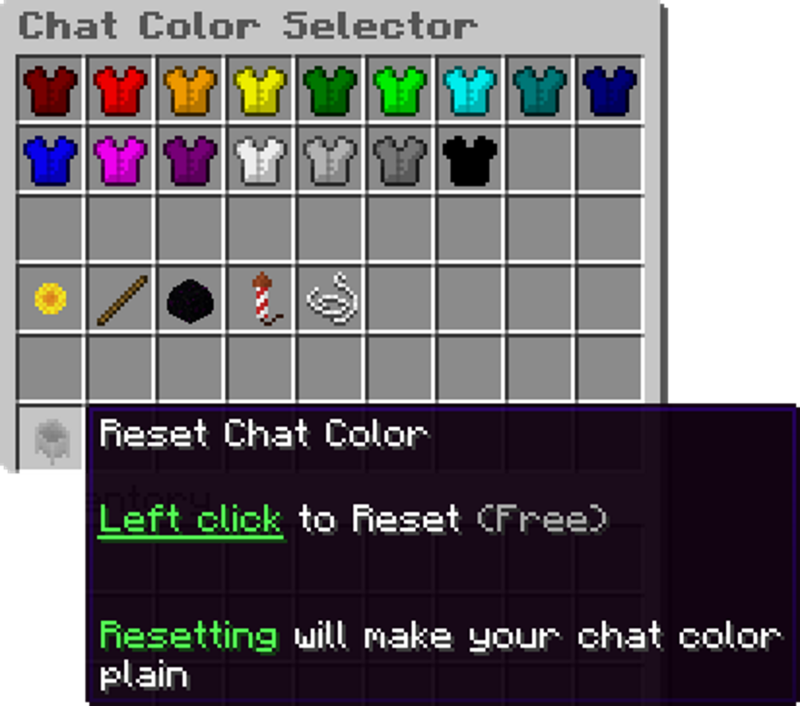 Note: The Chat Color Selector will not close by itself after resetting your chat color. You must close the Chat Color Selector just like you would close your inventory. Excellent! Your chat color is now reset.